LeTort Monitoring is carried out monthly by staff at the Alliance for Aquatic Resource Monitoring (ALLARM), and includes taking dissolved oxygen, pH, conductivity, dissolved solids, nitrates, orthophosphates, and turbidity measurements at various sites along the LeTort. In addition to measuring the chemical features of the LeTort, ALLARM also measures aquatic plant growth diversity and coverage within the stream. ALLARM has been conducting these tests on the LeTort for the past 25 years, with the intention of monitoring the health of the stream as time passes. 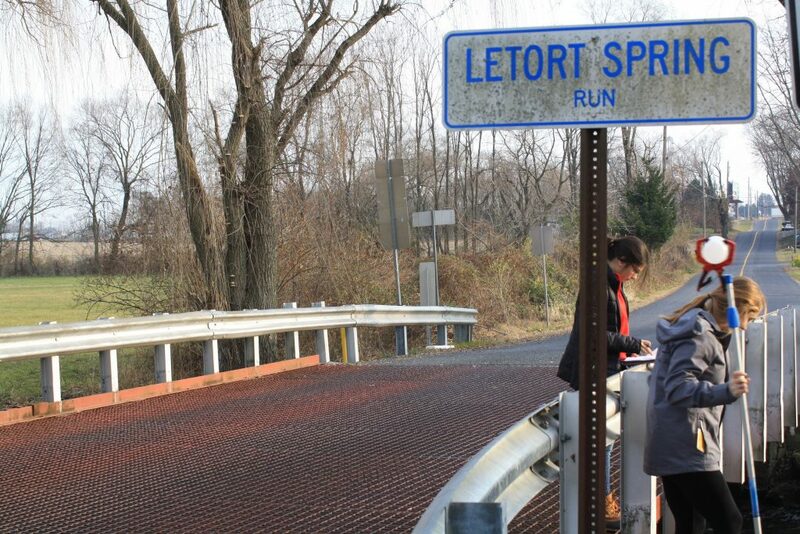 While the water quality of the LeTort has not changed as much as other streams in central Pennsylvania, the environment that surrounds the stream has become more developed. On Monday December 10, I had the pleasure of experiencing LeTort monitoring for the first time. While it was great to take a break from studying and get outside, I couldn’t help but notice the roads, houses, and lawns that surround the stream. At three of the sites, the LeTort runs parallel to a quarry that belches out a constant hymn of limestone tumbling up conveyor belts, and trucks rumbling up and down gravel roads that divide what used to be LeTort wilderness into smaller and smaller parcels of land. At these sights, the sound of the LeTort’s mellow flows are all but drowned out by the sound of man, and the development that accompanies him. While monitoring, I spotted a large great blue heron fly across the LeTort and into a tree in a parcel of forest adjacent to the stream, and although I could not hear the beat of the heron’s wings over the operations of the quarry, its mere presence reassured me that the LeTort is alive and well. Testing the water quality of the LeTort.